After receiving threatening emails and phone calls, Diablo Valley College political science professor Albert Ponce stopped letting his 9-year-old daughter touch the mail at home, started parking in different spaces at work, took different routes between his office and car, and reorganized his daily routines. 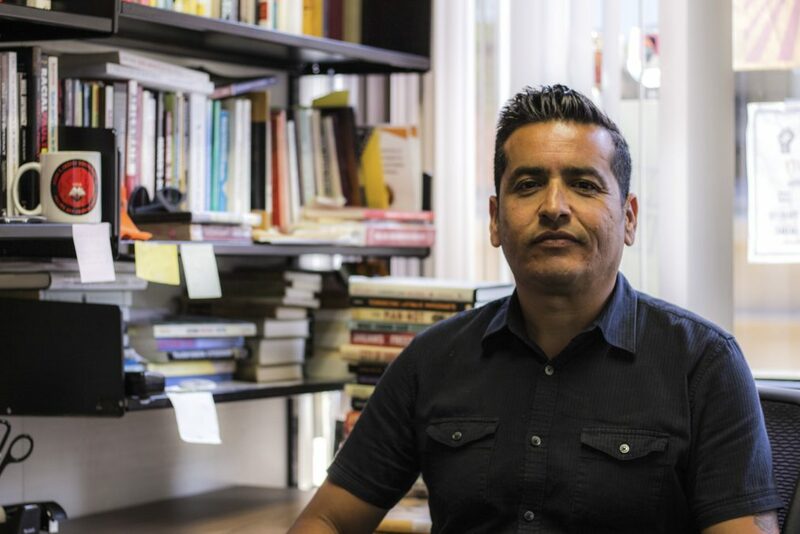 Ponce, a political science professor at Diablo Valley College in the San Francisco Bay Area, and his wife didn’t know how to explain to their 9-year-old that her father was receiving death threats. “Only Mom and Dad can touch the mail” became a new house rule. Each night after putting his daughter to bed, Ponce would peek through the windows of his home to check for strange cars or people outside, “precautionary measures,” he said, after an internet troll army had targeted him. It started just before Christmas last year. Ponce logged in to his college email account expecting the usual: work messages, a few season’s greetings from family and colleagues, maybe some spam. Instead, he found an inbox full of vitriol. “I might just take a trip to Mexifornia and sit in on one of your hate speeches,” read one of the hundreds of messages. “Your (sic) racist, Marxist filth, you ave (sic) been noted and we all know you now,” read another. Ponce soon discovered that his Facebook page and personal website were cluttered with nasty comments as well, and his office answering machine was full. Hundreds of people were calling for his firing. They slung racial epithets, told him to return to his home country (Ponce was born in Orange, California) and made thinly veiled death threats. “The Only Good Red Is A Dead Red. Give that guy some helicopter therapy,” read one Facebook comment, a reference to a series of memes, popular in white nationalist circles, of Chilean dictator Augusto Pinochet’s practice of throwing political enemies out of helicopters. Ponce had no idea what had started the onslaught of hate speech and death threats. What, he asked himself, had he done to deserve this? He had entered the nightmarish club of teachers and professors who have been singled out, berated and threatened with violence by anonymous trolls for performing their jobs. Ponce is one of dozens of educators – if not many more – who in the past two years have been featured in conservative media pieces, placed on watchlists and targeted by the internet outrage machine. Their offenses have ranged from lecturing on hot-button subjects such as race, gender or climate change to posting provocative comments and news articles on their social media accounts. The recent rise in media maelstroms swirling around educators has raised important issues on the limits of academic freedom – and its distinction from freedom of speech – and the raging battle between the left and right on college campuses across the country. While political friction among teachers, administrators and the public is nothing new, the question of how universities should handle public outcry in the age of social media is a daunting new aspect of academia that morphs as quickly as people can type. “The attacks on faculty and institutions of higher education we see today have created a climate as hostile to academic freedom in the United States as in any historical period in the 20th century,” said Hans-Joerg Tiede, associate secretary for the Department of Academic Freedom, Tenure and Governance at the American Association of University Professors. At school, Ponce took personal safeguards. He started parking in different spaces, took different routes between his office and car, and reorganized his daily routines. “Just trying to not be so predictable, that was key,” he said. Two weeks later, larger conservative websites began targeting him. Breitbart ran a story saying he told students “that its (sic) acceptable to violate U.S. laws,” then Fox News featured him. A spiteful, systematic troll army set in on him. His home phone number, address and even pictures of his daughter were posted on Facebook and the internet’s free-speech tarpit, 4chan. 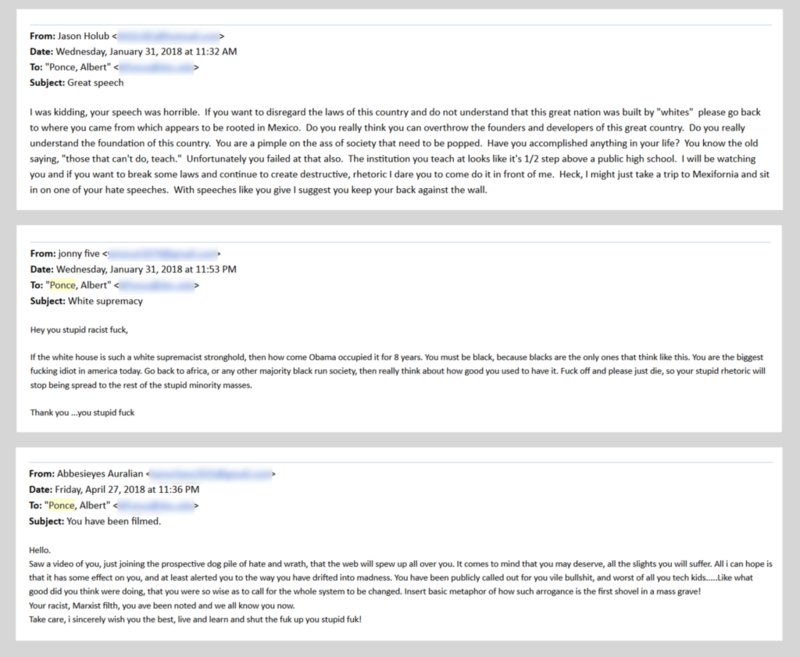 It took Albert Ponce a few days, but he eventually traced the deluge of emails, phone calls and comments back to their source: Someone claiming to be one of his students had sent a video of one of Ponce’s lectures to a right-wing media site called The Red Elephants. “Ponce needs to be exposed,” the note said. Students like this have submitted teachers’ names to professor watchlists and filmed them without their consent, encouraged by right-wing college news sites such as Campus Watch and The College Fix. On Dec. 22, Red Elephants co-founder and contributor Vincent James O’Connor – who goes by Vincent James or Vincent James Foxx online – posted a story about Ponce’s lecture, headlined, “DVC Professor Calls For Violent Overthrow Of ‘White Supremacist’ America.” Filmed by a student journalist for the campus newspaper, The Inquirer, the original video documented Ponce’s guest talk for a social justice lecture series about white supremacy in the United States. In the lecture, Ponce presented his research detailing centuries of slavery and racism in Western countries. Beginning with the arrival of Spanish conquistadors, he said, colonialism, manifest destiny and the European model for the modern education system set the foundation for a systematically racist United States. White supremacy wasn’t just Richard Spencer and the Ku Klux Klan – it was the foundation of America, he said. “We’re taught to get up and pledge allegiance to the flag every single day, a flag that is not really representative of everybody who’s standing up in that room,” Ponce said in the lecture. Embedded in O’Connor’s post on The Red Elephants was a video featuring his commentary and clips from the Ponce lecture. The clips, decontextualized and mashed together, created a more sinister narrative. O’Connor’s new video painted Ponce as a Marxist advocating the armed and violent overthrow of the United States. “Karl Marx, one of the most profound thinkers in the history of Western philosophy,” said Ponce in O’Connor’s video, the next segment cut to remove the rest of Ponce’s thought, which was that Marx openly supported racist actions by European colonialists in North America. Public outcry over Marxism has been a staple of college campuses for at least a century. But the internet has enabled the intensity of that outcry to reach new and startling levels. To O’Connor, posting videos such as the one of Ponce would help level the playing field for conservatives in the university system, he said. Comments on the Albert Ponce post on the FILM Your Marxist Professors Facebook page reveal Ponce’s personal information and are filled with hate speech. On the FILM Your Marxist Professors page, O’Connor offers to protect the identities of aspiring student saboteurs. “We can use our video editing software to make it look like the video is coming from the other side of the classroom and from a different desk,” reads the Facebook page’s information page. The first post on the Facebook page was O’Connor’s take on Ponce’s lecture. It has 1 million views and more than 4,000 comments and has been shared more than 26,000 times. Meanwhile, Diablo Valley College administrators were silent on the issue. Neither the college nor the Contra Costa Community College District released any statements addressing the controversy, though both received their share of abuse from angry people demanding Ponce’s firing. “They were bombarding us with phone calls, emails and particularly social media,” said Timothy Leong, director of communications and community relations for the district. The college still was reeling from the public relations nightmare caused by former adjunct professor Eric Clanton, who was charged with four counts of felony assault after he was accused of attacking several pro-Trump demonstrators with a U-shaped bike lock at a 2017 Berkeley rally. Diablo Valley College quickly distanced itself from him. In a plea agreement in August, Clanton entered a no contest plea to one misdemeanor battery charge and was sentenced to three years’ probation. But before police had even identified Clanton as a suspect, people had begun calling to let district administrators know their opinions of the professor. “We had hundreds of … people swearing at us, people yelling and screaming and threatening to take their children out of our colleges,” Leong said. Not knowing what to say to the angry internet mob, the district decided to say nothing. But in Ponce’s case, Leong said the district has supported Ponce behind the scenes and has taken no punitive measures against the professor. “At this point, I don’t think that there is anything that we have seen or have heard that has crossed the line,” he said of Ponce’s lecture and professional record. How to define the gray area between censorship and academic freedom is a question that schools and professors have tried to answer since the start of the American university system. Today, teachers across the country are singled out for their political transgressions – as perceived by conservative publications and the troll army that reads them – and the high schools and universities they work for have to juggle the media storm that follows. Since fall 2016, the American Association of University Professors has logged 50 cases of harassment reports filed by professors nationwide. Of them, nearly half have reported threats of violence. When the controversy involves social media, that proportion jumps to 79 percent. When a teacher is featured on Fox News, Breitbart, Campus Watch or The Red Elephants, the harassment follows in short order, making high-profile cases easy to count. But a recent report by Abby Ferber, a sociology professor at the University of Colorado Colorado Springs, suggests that many professors experience targeted online harassment even when stories or videos about them don’t go viral. Those teachers still suffer racial epithets, misogynist comments and death threats out of the public eye. But to Vincent James O’Connor, it’s the teachers he accuses of being Marxists and their supporters who are the uncivil ones. “Anyone who is trying to play down these statements by these professors is a racist,” he said. Teachers who are people of color, women or members of the LGBTQ community are far more likely to be harassed in addition to already enduring lower chances of promotion and tenure, Ferber concluded in her report. Ferber herself faced online harassment after she was mentioned in a 2013 Campus Reform article about an annual conference that examines white privilege and again this year when the same publication reported that she offered academic credits to students who attended the conference. In December 2016, Orange Coast College student Caleb O’Neil secretly filmed psychology professor Olga Perez Stable Cox saying in a lecture that the racial division in America since the presidential election was “an act of terrorism,” likening the divide to a civil war. The video was posted on YouTube by O’Neil’s friend and then-president of the school’s College Republicans, Joshua Recalde-Martinez. It has more than 500,000 views. “One of the most frightening things for me, and most people in my life, is that the people who are leading the assault are among us,” Cox says in the video. In February 2017, O’Neil was suspended for the spring and summer semesters for violating state and college conduct codes, which state that students are not allowed to record “any person on District Property or at any District function without that person’s knowledge or consent.” Two weeks later, he was reinstated by the college district’s board of trustees. Cox was plagued by threatening phone calls to her personal phone. When a troll emailed her a picture of her house with her address attached, she left the state temporarily and missed the last week of classes that semester. O’Neil said he received an A in Cox’s course. 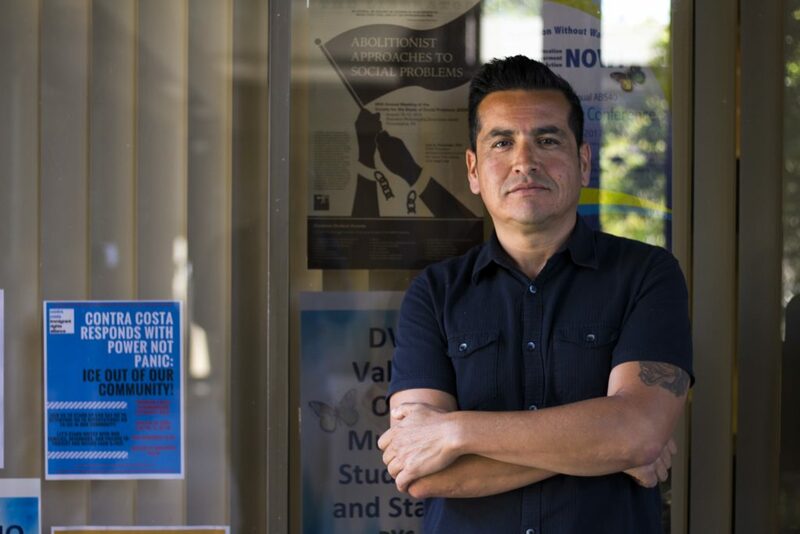 Diablo Valley College political science professor Albert Ponce received hundreds of threatening emails after a video of his provocative lecture on white supremacy was posted by far-right blogger Vincent James O’Connor, co-founder of The Red Elephants. American Conservative Senior Editor Rod Dreher didn’t see it that way. In an article condemning Curry, he wrote that the professor was highlighting occasions “when it is appropriate to kill white people.” To Dreher, it was a call to arms against whites. Curry’s office email and answering machine were so inundated with racist death threats that he feared for his safety. Texas A&M is a gun-friendly campus, and he wasn’t taking any chances. Curry and his family moved out of town. He commutes to work every day across state lines and teaches his more provocative material only in online courses. To him, the issue goes deeper than a question of being misunderstood. Dreher was clear that he does not condone the trolls’ actions: “I deeply hate the abuse that Curry received. He did not deserve that. Nobody does,” he wrote. But Dreher said that even if he knew beforehand that Curry would receive death threats, he still would have published the article. “None of that changes the fact that Tommy Curry wrote and said incendiary, racially provocative things. He deserved to be called out for it,” he wrote. Conservative media groups that trigger scandals often are well funded and highly organized. Some are backed by a few of the wealthiest conservative donors in the country, and they use their influential platforms to recruit students to become “citizen journalists” – agents provocateurs armed with cellphone cameras. Campus Reform articles helped stoke the scandals surrounding professors Albert Ponce, Tommy Curry and many others. According to The Chronicle of Higher Education, editors at Campus Reform’s headquarters in Arlington, Virginia, keep careful track of their “victories,” instances in which a report published on their website results in a change in university policy or the sacking of a professor. A liberal influence guide on the Campus Reform website, titled, “The Evil Empire on Campus,” lists college groups supported by “major, national leftist organizations” as one of the many examples of liberal indoctrination at universities. The site is piloted by the Leadership Institute, a nonprofit that claims it has trained more than 200,000 “conservative activists, leaders, and students” since its inception in 1979. The Leadership Institute’s tax filings show net assets of more than $25 million in 2016, just over $1 million of which was funneled into Campus Reform. Roughly two-thirds of the institute’s income comes from philanthropist groups such as the Charles Koch Foundation, The Lynde and Harry Bradley Foundation and DonorsTrust and Republican super-donors such as Richard Uihlein. Together, these donors gave over $944,000 to the Leadership Institute from 2014 to 2016. According to The Chronicle of Higher Education, publications such as Campus Reform and The College Fix pay student reporters about $50 per article. Many of the stories are sourced from the Leadership Institute’s network of close to 1,600 conservative student groups across the country. “All it takes these days is one kid with a smartphone who turns on their recording app,” Sterling Beard, director of journalism training at Campus Reform, told The Chronicle in 2015. Turning Point USA is a Trump-endorsed partner of the Leadership Institute. Founded by 24-year-old Fox News regular Charlie Kirk in 2012, the multimillion-dollar organization holds invite-only conferences and workshops for conservative students. Tax filings show the organization is funded by many of the same groups that support the Leadership Institute, including the Bradley family, DonorsTrust and Uihlein, as well as Illinois Gov. Bruce Rauner. Together, these donors gave nearly $600,000 to Turning Point USA from 2014 to 2016. Turning Point USA trains students in the art of viral filmmaking. The goal is to document campus “snowflakes” ­– a derogatory term for young liberals viewed as easily offended – whenever they’re caught pushing leftist agendas. Conservative superstars such as commentator Ben Shapiro and Campus Reform Media Director Cabot Phillips speak at the group’s conventions and encourage college kids to always be prepared to film. They even offer to help student-made videos go viral by reposting them on their websites. The Professor Watchlist is another product of Turning Point USA. The blacklist of professors, many sourced from Campus Reform articles, seeks to “expose and document college professors who discriminate against conservative students and advance leftist propaganda in the classroom.” Would-be saboteurs are encouraged to submit tips to the watchlist along with photo or video evidence of the offending professor. In June 2017, Trinity College sociology professor Johnny Williams shared an article on his Facebook page that caught the attention of the outrage machine. The article, from an anonymous writer known as “Son of Baldwin,” stated that people of color should refrain from saving racists during shootings and other tragedies. Williams thought the article prompted a necessary discussion. The death threats streamed in. Reporters gathered outside the professor’s home. The Connecticut college closed for a day, and Williams and his family went to stay with relatives for a while. He expected Trinity College to back him up. Instead, administrators placed him on immediate involuntary leave. “They said I was going to take it whether I wanted to or not,” Williams said. Donor support, public opinion and enrollment rates can plummet with every moment of silence from college administrators, so some believe it’s better to back off than to risk a catastrophic pullout from supporters. Trinity College released a report a month later detailing the facts surrounding Williams’ case and clearing him of wrongdoing, but administrators never apologized for placing him on leave. Tommy Curry, who was similarly shunned by Texas A&M’s administration, shared Williams’ sentiment. The ease of internet anonymity means that, with few exceptions, it’s extremely difficult for law enforcement to discover who leaves death threats. Teachers sometimes file reports with campus police, but arrests appear to be rare. In the case of students who use recording devices in class, professors are equally limited. There are 11 states in which recording a private conversation in a private place without consent is illegal. California is one of them. But Stanford University law professor Robert Rabin said public school classrooms are considered public spaces, and even a class lecture at a private high school or college would be difficult to claim as private information in either a criminal or civil case. Teachers instead must rely on school policy and state education code, which often means the issue is resolved with the school rather than law enforcement. Social media, where many of the attacks occur, also offers little defense for teachers. Facebook spokeswoman Ruchika Budhraja wrote in an email that neither Campus Reform nor FILM Your Marxist Professors’ pages violate the site’s community standards, even though the latter’s Twitter profile was suspended permanently in April for violating that site’s hate speech rules. User comments containing death threats violate Facebook policy, but the site’s 7,500-person content review team doesn’t see many of those comments unless they’re reported, which the company encourages users to do. Vincent James O’Connor made it clear that he doesn’t condone death threats or doxxing ­– the release of someone’s personal or private information ­– by his audience. “That should have been illegal a long time ago,” he said. But the self-styled reporter balked at the idea of monitoring The Red Elephants or FILM Your Marxist Professors’ social media sites for death threats or teachers’ personal information. “Oh, so you expect me to sift through 4,000 comments and police the comments? Does CNN do that? Does Politico do that? Does Huffington Post do that?” he said. HuffPost and CNN both employ moderation teams to monitor their comment sections for offensive content. Politico doesn’t state its comment policy and didn’t respond to requests for clarification. The rise in teacher doxxing has created a paranoid teaching environment, educators say. Some are able to shake off the abuse and move forward, while others have grown quiet. For her report on the phenomenon, University of Colorado professor Abby Ferber interviewed several female teachers who had decided to teach only online or to stop giving controversial lectures altogether. Interviewing these professors, whose lives had been permanently altered by the abuse, was jarring to Ferber. Vincent James O’Connor remains indignant about teacher harassment by readers of The Red Elephants website and FILM Your Marxist Professors Facebook page. To him, online harassment is just a part of life now. Tommy Curry said he has no plans to move his family back to Texas A&M’s hometown of College Station. Albert Ponce still hasn’t told his daughter about the death threats, but she is allowed to touch the mail again. This story was edited by Robert Salladay and Andrew Donohue and copy edited by Stephanie Rice and Nikki Frick. Brian Howey can be reached at deathandtaxes@tutamail.com. Follow him on Twitter: @SteelandBallast. 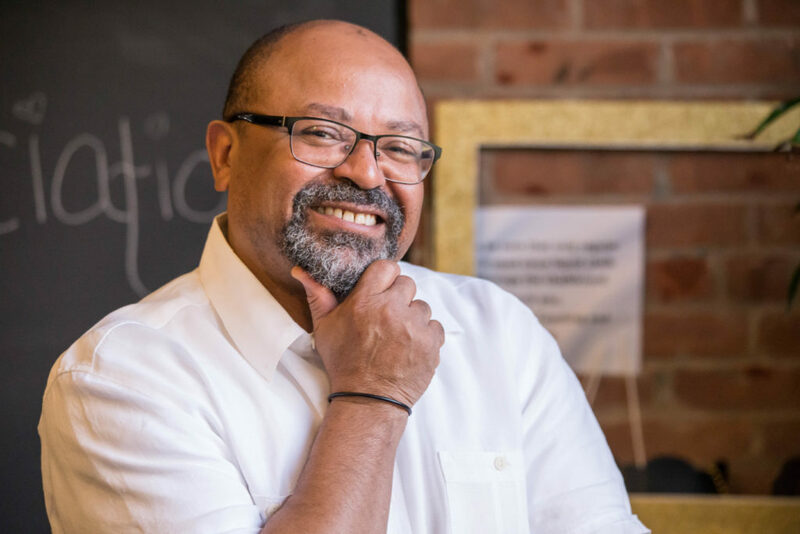 Johnny Williams, a sociology professor at Trinity College in Connecticut, was targeted by internet trolls in June 2017 after he reposted a provocative article on racial violence on his Facebook page. The college placed Williams on administrative leave due to the resulting backlash.Credit: Courtesy of Johnny Williams Are colleges taking sides?